The history of the Neolithic-Early Bronze Ages in Great Britain and Ireland are akin to a blank piece of paper, with here and there a dot, a dash, a thumb print, some mud streaks and even some jam. But all these things tell us almost nothing about the people, their society, their way of life, their religious beliefs, or their ancient history. If it wasn’t for the fact that they left megalithic constructions, pottery, and barrow cemeteries, we’d know almost nothing about them at all. But even those only give us a tiny glimpse of their lives. How did they view these things, what all took place at stone circles, henges, long barrows and places like Newgrange and Maes Howe? What traditions, histories and knowledge did they bring, and from how many diverse places? What gods and goddesses did they follow, and did they create a whole new religion in the Isles, one which incorporated many of their shared ideas? The DNA of both the hunter gatherers and the farmers, comes from the Continent. Before c6200 BCE, people could wander, from what is now the Continent, right into England. Not only was Doggerland still there, but the channels of water between the Continent and England, and Ireland and England were much narrower then. If you wanted to sail across, it wouldn’t have been as far as it is today. All coastal areas around the world have lost ground, are still losing ground. Settlements have been found off the coast of Spain, Iraq, India, in the Dardanelles, and in the Black Sea. There are theories which state that the Mediterranean may have been mostly dry during the last Ice Age, and that the Black Sea was once a fresh water lake. This would have made wandering from one area to another much easier. The map on the left shows what Europe may have looked like before Doggerland disappeared. The black line is the St. Michael’s Ley. The map on the right shows the distribution of Beaker pottery. In the Isles we find a mix of ancient DNA from the Iberian Peninsula, Greece, North Africa, the Fertile Crescent, the Caucasus, the Eastern Mediterranean, and the Balkans. The oldest matrilineal DNA comes from the area of Delphi, Greece, which entered England and Ireland c7300 BCE with the hunter gatherers. In Ireland this DNA is fairly evenly distributed. Jasmine and Tara hailed from the Fertile Crescent and the Caucasus. These are the two matrilineal lines connected to herding and crop growing, and some of them may have come with the Cardium pottery people, since they are also connected to the spread of farming. Their earliest pottery c6500 BCE was found on Corfu, which was connected to mythologies about Poseidon, god of the Sea. Corfu is also on the Apollo-St. Michael Line, which runs from Mount Carmel to Skellig Michel in Ireland. Cardium pottery and Jasmine’s descendents were found on Mount Carmel, the end of the line, or the beginning. This line was important for several thousand years. Christian pilgrims still follow this line from Mont St. Michel, France, to the Holy Land. In ancient times it was used going in both directions, not only for trade, but also to obtain fibrolite and jadeite from the Ligurian Alps, to make polished axes. These do seem to have been ritual objects, since they usually show no sign of having been used as a tool. There are several mountain passes in Northern Italy which lead into France and Switzerland. The San Bernardo Pass is on the line, and has a stone circle right on the pass, which today is halved by a road going through the centre one way, and the border between France and Italy splits it in two the other way. As can be seen on the above map, early megalithic culture seems to have been spread by sailing. By the time the Windmill Hill people entered the UK and Ireland, they already had several backgrounds among them. Until recently, it was thought that all the megalithic building was done by the Beaker people, but now it seems that much of it was already built before Beaker pottery came along, including most of Stonehenge. The Beaker people left many question marks. Were they a distinct culture, or did their pottery just become very popular? With them comes an assemblage, consisting of Beaker pottery, stone ‘wrist guards’, metal working, and round barrows. Their knives were similar in style to Egyptian ones. The exact root of these people is still being debated. The Iberian Peninsula or the Rhineland? Or were they a people at all? Or did this assemblage just become part of new innovations? Some of the movement was by land, and some was by sea. Although there is no sign of a full-scale migration of Beaker Folk, there does seem to have been a new lot of people who came to England c2400 BCE. The Amesbury Archer being an example, he grew up in the area of the Swiss Alps. He’s been dated c2350 BCE. His younger family member had spent his youth in either Wales or Scotland. They were found with gold ‘hair tresses’, these being the oldest gold articles in England to date. He’s been called an archer because he had two stone ‘wrist guards’ and many arrow heads buried with him. But he also had a metal working kit with him. Whether these stone objects were in fact wrist guards is debatable. About a hundred of these have been found in the UK and Ireland. Most have some holes drilled in them, which would allow you to tie it to your wrist, but for archery these would be useless, since the bow-string would catch on either the stone or the fastener. One theory put forward by Martin Doutré, is that they were a measuring device. This seems more logical, since there is one with all the holes filled with gold foil. They also have some edges which are tapered, and I wondered if they were for resting your hand on when writing. There was such a thing as writing by 2400 BCE. The above symbols were found around the Black Sea area and belong to the Vinca Culture, they date c4000 BCE. What struck me is that the top ones resemble Ogham, which was also written in different ways. The most common is the straight lines, but it was also written as dots on a line, resembling beads of a necklace. I’ve also seen the comb shapes used. Usually the top line and the two outside ones became the frame, the lines in between were the letters, which is slightly different from this version. Since this already existed in 4000 BCE, it wouldn’t be impossible for another version of this to show up in the UK and Ireland by the time the first part of Stonehenge was built, since some of the ancient DNA did have connections to that area. I’ve read about several of the burials connected to wrist guards, for the most part these men were said to be tall. The Wessex lord in the Bush Barrow was also a tall man, over six feet, making the archaeologist remark that he would have been much taller than his contemporaries. Although he had no wrist guard, his treasures are among the most important from that time period. Bryan Sykes names the Windmill Hill people, the little dark people. This was certainly still true of my grandfather who could have fit in anywhere in the Middle East. His grandmother’s matrilineal DNA came from Jasmine. This great great grandmother was a small dark-haired woman from Llanrwst, North Wales. I’m surrounded by Celts of both Irish and Scottish descent, most of the Scots came from the Highlands and Islands, and the little dark people are still alive and well among both groups today. The next oldest gold objects in Britain are the Rillaton and Ringlemere cups. They’ve been dated c2300 BCE, according to the burials they were found with. At first archaeologists thought that they may have been votive offerings and dated them c1650-1400 BCE because of a much plainer cup found in Mycenae which came from one of the grave shafts. Only five other such cups have been found on the Continent, all have been dated c1700-1500 BCE. The Rillaton cup and a computer reconstruction of the Ringlemere cup which was damaged by a plough when found. Mycenaean Treasure including the corrugated cup. 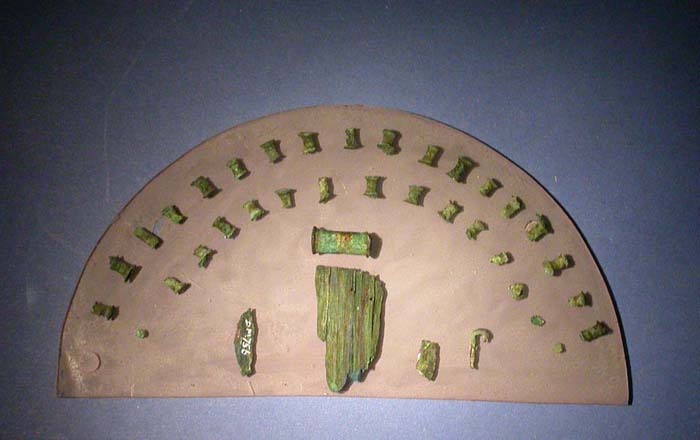 At one point it was taken for granted that all similar objects found in Mycenae and England, were the originals in Mycenae and copies in England. After having a good dig around, I found that most are older in England rather than in Mycenae. The Treasury of Atreus, with its curved lintel over the doorway, wasn’t built until c1250 BCE. The Sarsen Circle at Stonehenge had already been in existence for 1250 years by then. A cross-section of the Treasury of Atreus looks much the same as one of Newgrange, c3150 BCE, or Maes Howe, c2800 BCE, except that the passage of the Treasury was on the outside rather than on the inside as at the other much older constructions. The Treasury was a tholos, and also had an opening above the doorway reminiscent of the roof boxes at Newgrange and Maes Howe, although archaeologists say that there had been a triangular stone in the opening of the Treasury. Tholoi were already quite old by the time the Treasury was built. The oldest are at Khirakitia, Cyprus, dating to the 6th millennium. These were all houses. The oldest tholoi to be used as tombs were in Oman, and unless the Mycenaean cup was an heirloom when it was buried, the cups in England are older by about six hundred years. There was contact between Mycenae and England. A typically Mycenaean knife is carved on one of the Sarsen uprights at Stonehenge, along with many representations of bronze axe heads, the same sort that the Wessex lord had with him. The first shipment of amber to arrive in Mycenae was in c1750 BCE. It’s believed to have come from England because the spacer plates were the same as those found in England. The necklace below shows the spacer plates, it came from the Golden Barrow or Upton Lovell G2e. Bronze double-headed axes from Mycenae appeared in Cornwall and Wessex c1300 BCE. The Boy with the Amber Necklace, who is buried close to Stonehenge, is said to have been from somewhere on the Mediterranean, he’s dated c1350 BCE. Did he come from Mycenae, along with the axes? The Golden Barrow is contemporary with the Bush Barrow said to be c1900-1600 BCE, although I have seen Bush Barrow pushed back to c2000 BCE. The person in the Golden Barrow was cremated, while the Wessex lord in the Bush Barrow was buried, but the gold artefacts found in both barrows do seem to have been made by the same person. The same design elements were used on both collections. The next gold artefacts to come along are the Lunulae, these gold collars date c22o0-2000 BCE. Most have been found in Ireland, but others have been found in England, Scotland, Wales, France, Belgium, Germany, Zealand and Funen. There is one from Harlyn, Cornwall, two from St. Potan, France and three from Kerivoa, Brittany which were all made by the same person. His tool kit was found, and matched to these artefacts. There was also a partly finish lunula with the tools. On the Doggerland map, the black line is an approximation of the St. Michael’s Ley, it ends at a long V-shaped channel, where many rivers converged. Good trading place. This could be the area from which the amber in England came from, and Zealand and Funen may be two of the places left from the area with the deep V-shaped channel. Perhaps they traded gold lunulae for amber. Someone in England made the amber necklace which actually looks like a lunula. Unfortunately, we have no concrete date for either Bush Barrow or the Golden Barrow. Excavating Bush Barrow and getting a sample of the Wessex lord could certainly help to date him. The gold could also be tested, this could give some interesting results. The gold lunula from Tara has been shown to be a calendar device, as was the Wessex lord’s large gold lozenge, among other things. I know that there are those who do not want the burials at Stonehenge to be excavated, but this is keeping back the knowledge which could be gained. These people’s remains and the artefacts which are buried with them, are now the only clues we have to some of this history which has been lost for so long. By the time Bush Barrow and Golden Barrow were created, there were people there referred to as the Wessex Culture. Archaeologists are not sure whether this culture consists of the elite buried in the barrows, or whether this was a combination of all the different cultural groups which had made their way into that area. A new elite seems to have sprung up, or perhaps only a new amount of wealth appears with the burials. Burial practices had moved from cremation in the Aubrey holes c3000 BCE, to inhumation for the Wessex lord c2000 BCE, back to cremation in the Golden Barrow. Only the elite seem to have been buried in the barrows, whether long or round, archaeologists are not sure what became of the common people’s remains. The two gold lozenges and gold belt hook from the Bush Barrow. Can the articles found with these people tell us anything about them or their society? The artefacts that have been found in the Bush Barrow have been called, Britain’s First Crown Jewels, and the gent buried there, The King of Stonehenge. However, this term is now also used for the Amesbury Archer, but he had no crown jewels, only a metal working kit. Perhaps he made the artefacts found in the area of Stonehenge. With the Wessex lord were found two sheet gold lozenges, a sheet gold belt hook, a long lance head, a bronze axe, three bronze daggers, a stone mace head, bronze mounts and zigzag bone rings for the mace handle, and a number of bronze rivets and other pieces of bronze and wood. The angles of the small lozenge connected it to the surveying angles. Where the St. Michael’s Ley and the Apollo-St. Michael Line cross, they give angles of 60° and 120°. The belt hook is a quadrangle, which may have been representative of the Station Stone quadrangle at Stonehenge. 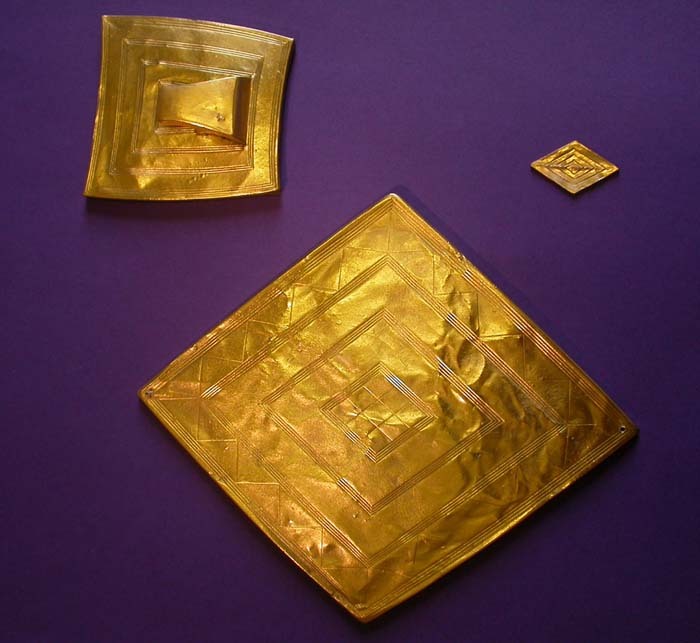 The large gold lozenge could be used as a calendar device as shown by J. Giesen’s Sun and Moon Lozenge Applet, but Martin Doutré found that there were many mathematical codes built into this piece, it wasn’t just an ornament, it had important functions. I found the inside lozenge in the surveying of the Aubrey holes (1), which gave the same geometry. It even included the two parallel lines crossing two parallel lines, the Ogham symbol for the hidden secret. This surveying formation was created at Stonehenge c3200-3100 BCE, and I call it the Stonehenge Logo. The symbol for the hidden secret is very fitting on the large lozenge, since there are such important functions connected to it. Such a well-kept secret, that it has taken over four thousand years for people to discover anything important about it. Still, many will say it was nothing more than a piece of jewelry. Yes, well………………………we’ve just been underestimating these ancestors. Their knowledge was much greater than we have given them credit for. Head of the bronze dagger showing the rows of tiny pins, and a drawing of what it may have looked like. One of the daggers is believed to have come from Brittany. Its handle was decorated with a zigzag made up of thousands of tiny gold pins, mounted one by one. The top of the handle was also covered with tiny pins. It is estimated that some 140,000 pins were used. I wondered why the maker hadn’t used a piece of sheet gold to create the zigzag, but realized that each small pin would have reflected light independently, similar to the way sequins do. The zigzag would look as if it were sparkling. Live lightning at his waist. One can only admire the patience and dedication to make such a piece, a princely item for sure. A dagger decorated with pins or studs was also found in one of the royal tombs of Ur, the oldest date c2500 BCE. The pins in this piece are not as small as the ones in the dagger from Bush Barrow. The triangular piece looks like a pointy hat, I wonder what may have been mounted in the handle just above the point. A piece of lapis lazuli, a ruby, turquoise bead?The blade looks as if it could be opened into a set of…….dividers or a compass. But of course, the channel down the middle of the blade is for the blood. I can still see it opening up into the dividers or a compass though. Something which ties in with some of the things from Bush Barrow, are the pottery cone mosaics found at Ur, Uruk, and Eridu. These long thin pottery cones were placed in adobe to create mosaics. The following picture shows three pillars which were in Inanna’s temple in Uruk. All these designs can be found on the Bush Barrow treasures. The gold pins were applied to the wood handle of the dagger in the same way as the cones were placed in the adobe. The lozenges inside lozenges are there. The smallest inside lozenge is made up of nine cones, a square three by three, Bab Ilu, the Gate of God, and considering this was at Uruk, that would seem to be correct, since Anu’s White Temple is there also. The small triangles on one of the pillars can be found on the large gold lozenge, and the button from the Golden Barrow. The zigzag can be found on the dagger handle, and is also present in the bone zigzag rings on the mace handle. The Treasury of Atreus is said to have had two half pillars with zigzag bands around them beside the entrance. They didn’t have to go to England for that inspiration. The cone mosaics date c3300-3100 BCE, right about the time someone surveyed for the Aubrey hole circle. Apparently such mounts and zigzag rings have been found in France and Mycenae. I have not seen a picture of these, but the ones in France are said to be gold. Here again, we find something which is the same in England as in Mycenae. However, I would say that the ones in England are the oldest, and that there was something significant about the bone rings. The Wessex lord could surely have afforded gold ones if he wanted them. The small gold lozenge is believed to have been attached to the handle of the mace. This piece may have been an heirloom when buried, and had some significance in that condition which we don’t understand. The mace head itself is highly unusual, as it is made of a piece of fossil stromatoporoid from Devon, given a beautiful oval shape, and drilled through the centre. The following comes from William Cunnington, one of the excavators of the Bush Barrow. Pliny’s description isn’t too bad considering the mace had been in a grave for two thousand years by his time. Although William Cunnington connects this to the Glain Nadroeth, or Druid’s Egg, he doesn’t seem to have realized that this object is in fact the Glain Nadroeth of folklore. An artefact which has not been recognized for what it is. Our Wessex lord was the Arch Druid. Celts are not thought of as coming to England until the Iron Age, supposedly from the Continent, having spread out from the La Tène and Hallstatt areas, but there is no proof of DNA or otherwise to show a mass migration into England and Ireland coming from those areas or from Europe at all at that time, mainly because the Celts were already in the UK and Ireland long before that. Both Bryan Sykes and Stephen Oppenheimer feel that both the hunter gatherers and the Windmill Hill people constitute the earliest Celts in the UK and Ireland. They may have brought the first Celtic languages with them. There are elements in the Welsh language which relate to Berber, Egyptian and Sumerian. With Celts, came Druids, their priestly class, and Julius Caesar did say they started in England, and then went to Gaul. Since he wasn’t maligning them by saying this, this is likely a true fact. However, this priestly class likely existed long before that. Each group that entered the Isles probably had its own priestly class. Did they pool their belief systems and create a whole new religion, which they took back to the Continent where it spread over a huge area? It would seem our Wessex lord was the Arch Druid and an astronomer/surveyor. His large gold lozenge may not have been a breast plaque, rather it may have adorned his turban as seen in the Book of Kells. A forerunner of the diadem in Mycenae and the Gold Hats in Ireland, Spain, France and Germany. My mother would say, the first man had a small lozenge on his head, the next one wanted something bigger, and the next one…………………..until we come up with the 90 cm. cone-shaped hat from Ezelsdorf, near Nuremberg a thousand years or so later. One of these gold hats was also found to be a calendar device, and it is possible that all of them may have had this function. This is a most interesting picture, the Druid’s beard has been divided and turned into knotwork, using the same design as can be found on the Wessex lord’s large gold lozenge. I think in this case he is meant to be Manannan, he has the red M on his forehead. In fact, as you turn the page around, this becomes MEW3, which is shorthand for the four directions, and the four major divisions of the year. The monk who created this page understood Ogham, and has used it in the same way as the creator of the Sator Square. There are interesting pages in the Book of Kells which I will write about in the future. However, getting back to the gent with the lozenge on his head, I think he is carved at Newgrange also. I think this particular stone must have stood upright at one time. The triple spiral now becomes a smiling face. He has rather fancy headgear with a lozenge on it. Newgrange dates c3150 BCE, about the same time that the first part of Stonehenge was created. The Aubrey hole circle was in existence before 3154 BCE, I figured their first calendar keeping day there was June 21, 3154. (5) Newgrange has another triple spiral just like this one inside. The Sunrise at Winter Solstice lights up this interior carving. If this is another astronomer/surveyor, what is he doing at Newgrange? Perhaps Newgrange was used for astronomy before people were buried there, or perhaps still used for that after they were buried there. Perhaps it was originally built for sky watching. The stars move by approximately one degree each night. If you sat inside Newgrange every night, you would be able to create a star map of that narrow band which would be visible. An observatory with a telescope, one which was stationary, unlike modern ones. If that seems like an odd idea, there have been passage ‘graves’ found which never had any burials in them, which puzzles archaeologists no end. One in France has the passageway on a slope, so you would be looking up at the sky at an angle which would be quite different from Newgrange. If I seem to be hooked on astronomer/surveyors and calendars in ancient times, it’s because that is what I have been finding. Once I started to keep those things in mind, ancient artefacts and constructions took on a whole new meaning. Try it, you may be surprised by what you find. Just keep in mind that there were some very well educated people around at that time. People who were well versed in higher mathematics, astronomy, surveying, and navigation. My upstairs files (my brain) which contain many snippets of historical knowledge which have no foot notes. This entry was posted in Ancient History, Bronze Age artefacts. There mus be a lot of archaeology hidden under the North Sea. Well written and informative blog. Thank you. I wonder if the Flood stories in Irish mythology might be connected to Doggerland rather than the Middle East? Doggerland is seldom thought about, in fact, many people probably don’t even realize that it existed at one time. More lost history. The Flood stories is a universal myth, which is unsurprising considering that the sea levels rose 300 meters. The idea that the knife is a set of dividers would be my guess. I will leave out the blood part. Yuch. Do you know the length of the blade? Other length questions: the capacity of the gold cups? The length of the egg stone handle? The length of the stick that went in it? The idea that the IP page is really the face of a man is cool. And I have to agree it is Cygnus that is shown. The image showing the writing: You may find looking up Aztec and Mayan numbers interesting. These are multiplication signs, numbers etc. It’s the archaeologists who always say that these channels in knives are for the blood…………. I don’t know how long the knife is, didn’t copy that info, nor do I know how long the handle was on the egg shaped mace head. Thanks for the tip about Aztec and Mayan numbers, will check that out. Your question about the gold cups made me do a little investigating. The Rillaton cup is 9 cm high, and is about the same shape and size as my measuring cup, which means that the cup could likely hold a pint, since 9 cm brings me to the 2 cup mark on my measuring cup. The Ringlemere cup is 11 cm high, and a pint would likely be at the top of the corrugation before it flares out to the edge. So I guess they weren’t just cups. The other interesting detail about these cups is the rivets that hold the handles in place. They’re lozenge or diamond shaped. This seems to suggest that they are also part of this weight and measure system which does seem to have existed at that time. Martin Doutre at Ancient Celtic New Zealand has a whole series of articles on his site. Among them he explains the mathematics which were built into the Bush Barrow and Clandon Barrow gold lozenges. There are weights and measures there, and not just from one tradition. Since you like numbers, I’m sure you would find his site fascinating. He can do the math.